Growing per capita emissions are in red. The global emissions increased by 0.6% in 2014 compared to 2013. Since the world population grew around 1.1% the global per capita emissions decreased only marginally. COP21 in Paris takes place in deep black shadow of reality. 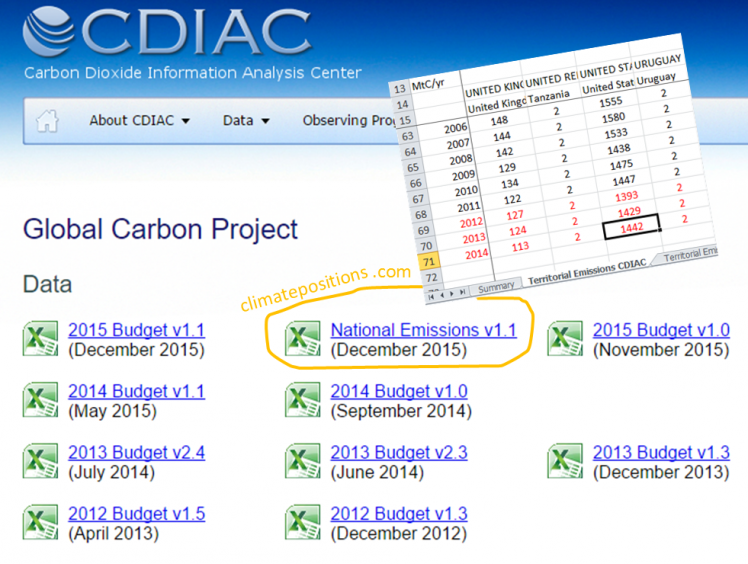 1The preliminary CO2 Emission data from 2014 of 199 countries is available in the menu ‘Calculations (Excel)’. Note that 1MtC = 1 million tons of carbon = 3.664 million tons of CO2 in The Global Carbon Project. 2012, 2013 and 2014 estimates are preliminary and based on energy statistics published by ‘BP‘. Once the delayed CO2 Emission data from the primary source (‘EIA, U.S. Energy Information Administration’) is published, then the calculation of Climate Debt will be altered. Primary source on CO2 Emissions: EIA, U.S. Energy Information Administration and data on preliminary national CO2 Emissions (including cement) are from Global Carbon Project (links in the menu “Calculations”). The image is from The Global Carbon Project; collage by Claus Andersen, 2015.